Top executives of Samsung Electronics, the world’s largest handset maker, are paid less than their counterparts at Apple, according to financial reports from each firm. Holding an annual general meeting of shareholders at its headquarters in Seoul on Friday, the Korean electronics giants said it paid a combined 33.9 billion won ($31.6 million) in salary to its top executives in 2013. When excluding the 300 million won handed out to Samsung’s five outside directors in 2013, the four top executives of the tech firm, who are also members of the board of directors, received an average of 8.4 billion won ($7.8 million) each. The Samsung heads are chief executives Kwon Oh-hyun, Yoon Boo-keun, and Shin Jong-kyun, and chief financial officer Lee Sang-hoon. The annual salary for Samsung’s CEOs and CFO is less than that paid to Apple’s top executive in 2012, according to a report filed with the U.S. Security Exchange Commission. Apple’s top five executives each received in 2012 around $59.2 million on average including stock options, which was about eight times more than Samsung’s executives. Bob Mansfield, former senior vice president of technologies, is said to have been paid $85.5 million in 2012, the highest among Apple executives, and Bruce Sewell $60 million. In the same year, Oracle CEO Larry Ellison was paid $78.4 million, and Tesla CEO Elon Musk received $78.2 million. An average annual salary for the top brass at Google stood at $32.2 million, four times higher than the Samsung chiefs. 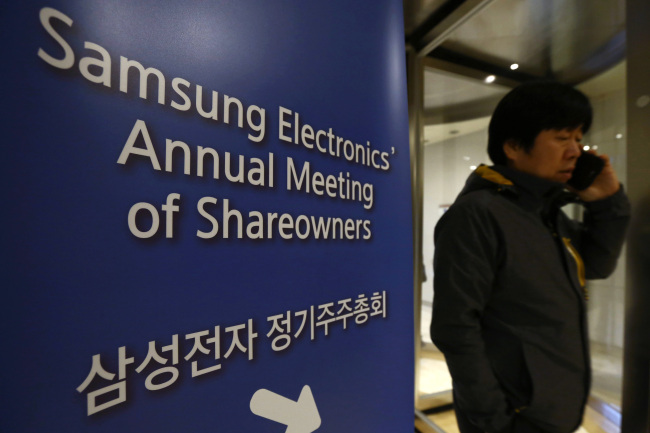 At its shareholders meeting on Thursday, Samsung and shareholders agreed to increase the total remuneration ceiling for directors to 48 billion won. Samsung Electronics posted record performance in 2013, raking in 229 trillion won in revenue and 37 trillion won in operating profit. At the meeting, which lasted less than an hour, Kwon promised to keep up the growth momentum of the firm by responding to economic uncertainties caused by prolonged economic downturns and cutthroat competition. “Although macro uncertainties are expected to continue in 2014 and competition will intensify in the marketplace, we will strive to turn these challenges into opportunities and improve our business results to bring increased value to our shareholders,” CEO Kwon said.